This show is dedicated to a band we’ve not featured before on Live and Loud! - Mesh, an electronic band from Bristol. The 3 original members of Mesh first came together in 1991, released their first EP in 1994...and Mark Hockings and Richard Silverthorn are still together and, at the time of writing, are just about to release the latest Mesh album, called Looking Skyward, in August 2016. Quite some record. Back in 2002, they had just released their 4th album, called Who Watches Over Me? and in support of that release they played quite a few live dates in the UK and Europe. 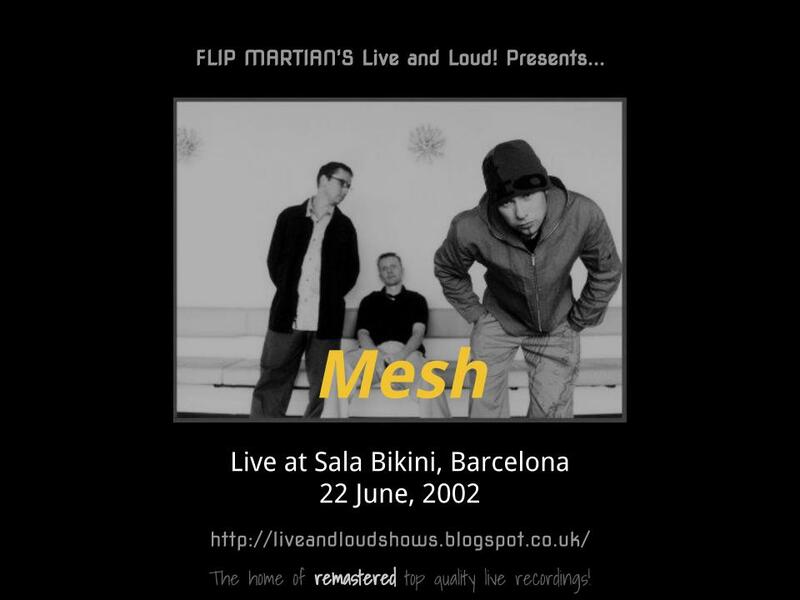 And it’s an unreleased recording of one of those gigs that we have remastered for you this time, from Barcelona in Spain. The original recording was in good condition but the ending was chopped off just after the last song of the main set ended, so no encores are included, I'm afraid. The encore incidentally consisted of Razorwire, It Scares Me and Confined. Its a shame they're missing but this gig was so good I didn't want to pass up the opportunity to make this one available. Anyway, judicious use of EQ and some mastering tools have really polished this up. The show is now available for free download HERE as 1 MP3 file. Or, if you would like to have separate tagged MP3s, or even lossless files in FLAC format, head on over to the Donations tab to see how you can obtain these for a very small donation towards the site costs.